What was Predefined Sales Actions is now…Saved Actions. All the great features of ‘Predefined’ – only now smarter, more accessible (from right inside the Contact view) and with the ability to insert multiple actions with one-click. Making it a cinch to create, edit and use Saved Actions. Insert multiple actions at once, e.g. your full sales process in timed steps! BONUS feature in this release: Mark Queued Actions as complete! How do Saved Actions work? Saved Actions are sales activities that are used repeatedly in your sales process. 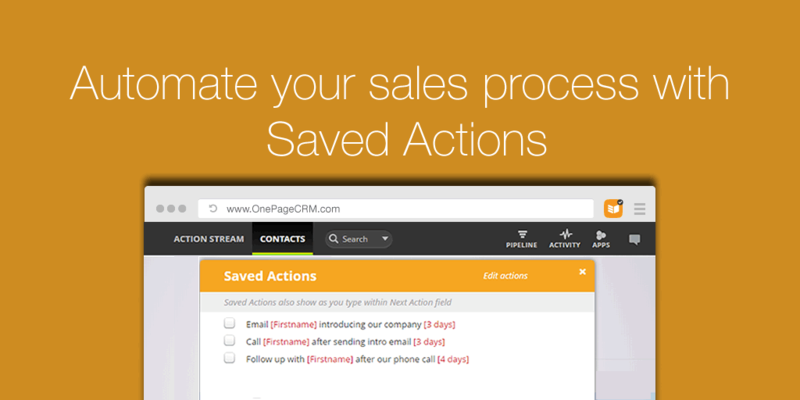 Simply create your most frequent sales actions within OnePageCRM for all your sales team to use. It’s easy to get started – just click on the icon to the left of the Next Action field and set up your sales activities for your sales process. Saved Actions are more accessible and easier to create. Reduce your workload by adding Actions suited to your organization and sales process. You already know what actions sales reps need to follow when it comes to a new lead, so now it’s time to build them into OnePageCRM. Using Saved Actions the sales team can open the contact and with one-click, set up a set of Next Actions from the saved list. How many times have you typed in the same Next Action? Using Saved Actions will eliminate the need for repetition. Saved Actions will appear as you type within the Next Action field. Using auto-complete functionality you can set Next Actions faster and spend less time typing! In addition you can easily insert saved actions directly from the Saved Actions list. No more repeating the same Next Action over and over for different contacts instead helping you focus on the task in hand. This quick process to create and insert Saved Actions allows you to work smarter and faster. 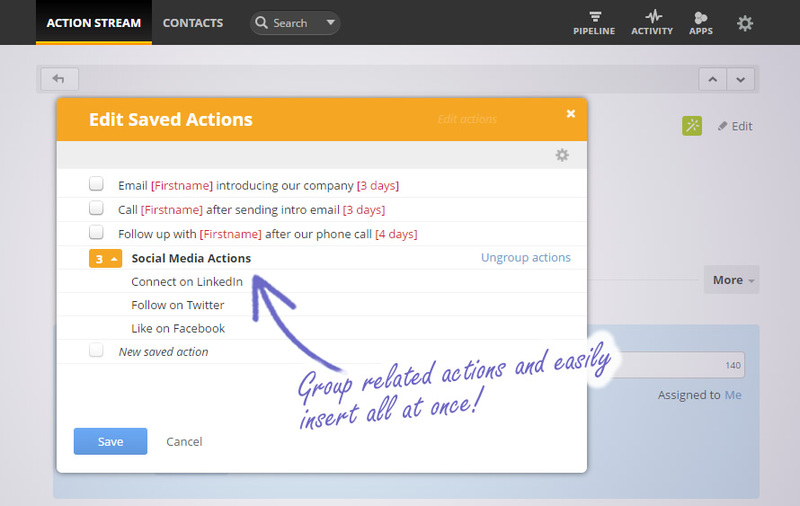 What’s really powerful is you can group actions enabling you to add multiple actions at once to a contact in just-one-click and they will save as queued actions! e.g Social Media activities. You have the power to specify when the sales action should fall due. Now you can be certain to follow up at the right time! Example “Email [Firstname] introducing our company [3 days]”. Like all businesses sometimes our sales process change so in turn, your sales teams process will too. It’s really easy to incorporate such changes to your Saved Actions, the easy edit function allows you to quickly edit or ungroup existing Saved Actions from within the Saved Actions popup. Oh and we can’t forget to mention you can now mark Queued Actions complete!! Great for when you have lots of small sales actions associated with a contact. Watch this space for more powerful additions to OnePageCRM. We’re aware the value our current customers got from using the Predefined Sales Actions and we’re certain that the new and improved Saved Actions feature has even more value to offer so you can continue to stay focused, automate your sales process while helping you to speed up your workflow! 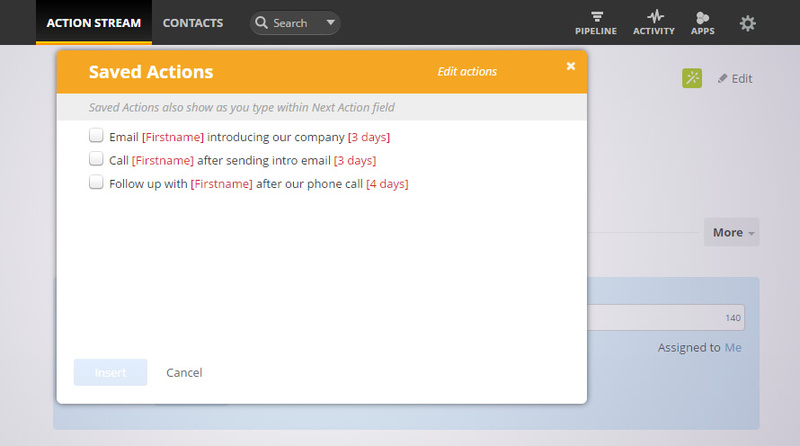 As with all our updates, we’re excited to hear how Saved Actions improves your sales process. If you have any feedback, please tweet us @OnePageCRM #AskOnePageCRM, comment below or contact me at evelynod@onepagecrm.com. A question about whether these Sales Actions can be integrated with websites using the API’s. For instance, a user on a website may take a specified action (ie click on a specified button), and we want to trigger a call or send a link to the user, and record it in the CRM. Is this possible? Hi Tim, thanks for your comment. Unfortunately, it’s not possible to integrate Sales Actions with your website to set such triggers. All the best Evelyn.